Building, optimizing, and maintaining an in-house email platform and sending infrastructure can be costly—and difficult to scale. Fortunately, leveraging SparkPost to extend your on-premises infrastructure alleviates the need for capital expenditures and technical personnel to manage and grow your company’s email systems. SparkPost’s API-driven platform is easily integrated with existing systems and delivers lightning-fast performance, the industry’s only guaranteed burst rate, and best-in-class deliverability. Let our cloud support your disaster recovery plan to replace secondary systems on hot-standby. Or, rely on SparkPost to prioritize delivery of high-value or time-sensitive email. Whatever the need, our API-driven infrastructure can be integrated to an existing email platform as a high-performing, cost-effective alternative to growing your server farm. Diversify Mail Streams. Prioritize critical mail streams by separating them to a dedicated system. Prevent roadblocks and deliver time-sensitive mail through SparkPost. Maximize Deliverability. According to Return Path, 1 in 5 emails go missing. Rely on the platform that sends over 37% of the world’s legitimate email with 97.8% inbox deliverability. Ensure Disaster Recovery. 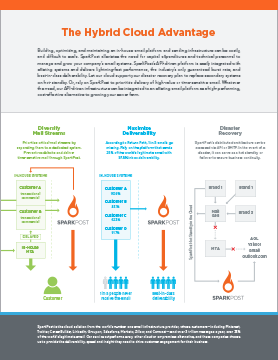 SparkPost’s distributed architecture can be accessed via API or SMTP. In the event of a disaster, it can serve as a hot standby or failover to ensure business continuity.